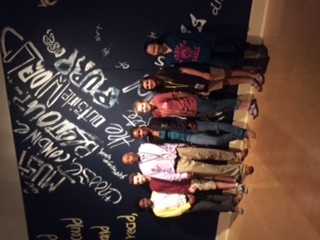 When Starkville, Mississippi’s Armstrong Middle School teacher Mikel Franklin brought a group of students to the Mississippi Museum of Art last week, they weren’t expecting to visit the Welty Biennial. But with one peek down the hall and around the corner into the exhibit, the students were intrigued. What drew them in? The amazing graffiti art of Armando Staton. I mean, let’s face it, how many exhibits actually allow a graffiti artist to paint on their walls? 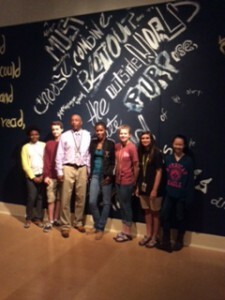 The Welty Biennial does and both teacher and students loved it. Pictured here with Mikel Franklin are students: Mia Robertson, Sommer Shmulsky, Helen Peng, Alyssa Outlaw, Miari Franklin, and Austin Parks.